Comparing your data against target goals is one of the fundamental tactics of data analysis. But which visual type is the best choice to represent your findings? 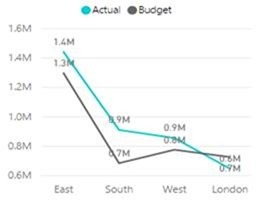 Microsoft Design & Data Visualization Lead Miranda Li reviews some likely candidates, and talks about why some visuals can work better than others for your audience. 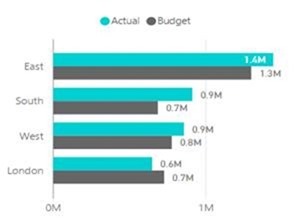 Comparing actual numbers against your goal or budget is one of the most common practices in data analysis. With cross tabs, the process can be quite easy and straightforward. For example, here we have a very small dataset about operational expenses and budget. We put actuals and budgets in the columns, and regions on the rows, and it seems fine. Or is it? Not if you care about your users and want to maximize your data’s consumability for them! 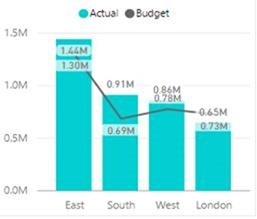 Let’s take a moment to see how quickly you can find out which region is below budget, and which region has the largest variance above budget. It's not very intuitive, right? A simple thing you could do to fix this is to add a variance column and color the regions by above or below budget. Another tactic you could use is to turn your table into a visualization, like the gauge charts shown below. Now your datasets are thoughtfully ranked, colored, and labelled, making it easy for users to quickly find insight. Can you now answer above questions much faster? Absolutely. 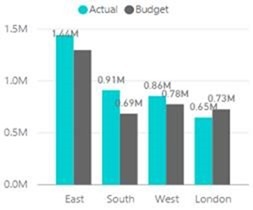 London is the only region that is below budget, and the South region greatly overspent their budget. This chart type does take space and attract attention though. It's appropriate when you only have a few visuals on the page, and their underlying metrics are valuable enough to spotlight. Additionally, it's worth it to note that some experts criticize gauge charts, saying that the curved bar is not as accurate as the straight bar in presenting data. However, whether you use them is up to your unique data and audience: if your customers are accustomed to it and love it, why change? An great alternative to the gauge chart is the bullet chart. The key difference is afore-mentioned straight bar vs. curved bar. With straight bars, the bullet chart is more precise in presenting data, and more compact. The latter is particularly useful when you have more regions or other categories of data on the axis. How about other chart types? A line chart, combo chart, or a cluster bar chart perhaps? The line chart is great for showing and comparing trends. But our focus here is point-to-point comparison, and the line chart can’t accomplish that. The bar-line combination chart is better, but with the labels overlapping, it's hard to tell which numbers are for what and where exactly the point on the lines fall. Cluster bars are not bad, but I can’t color those regions based on the conditional of being above or below budget. Plus, the side-by-side comparison is not as direct, and it takes double the space in comparison with the bullet chart. So which chart would you choose?